Watch a 3-minute video of a couple visiting North Cyprus for a week holiday! Bellapais village - Lawrence Durrell's "Bitter Lemons"
World-class golf with luxury accommodation with swimming pool, the private sandy beach and the spa. Great walks leading to magnificent castles with spectacular views, spring flowers and quiet villages. North Cyprus is a perfect destination for a relaxing tennis break. Coaching lessons are available. Diving in the warm and clear waters of the Mediterranean is a pleasure! Custom dive packages are available. The first and only app dedicated to North Cyprus. This app puts the top beaches, hotels, restaurants, sports, adventures, and historic sites in the palm of your hand! Our independent guide to Kyrenia is like having a local Cypriot by your side, sharing with you the best places to go, to eat, or just soak up the sunshine. 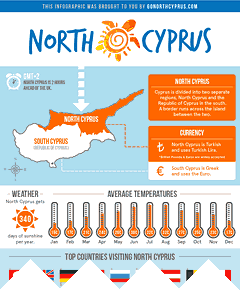 Our famous infographic about North Cyprus holidays. Feel free to share the infographic in social media or download it and use it on your own blog! GoNorthCyprus.com are your reliable and informed North Cyprus holiday experts, because our team live and work here! We know the best North Cyprus beaches, the friendliest Kyrenia hotels, the Northern Cyprus holiday villas with the best views, and the tastiest North Cyprus restaurants too. Book your North Cyprus holidays 2019 today, and discover the delights of North Cyprus with GoNorthCyprus.com, your North Cyprus holiday experts!